Make building projects run smoother, faster, and more efficient with leading-edge 3D laser scanning technology. Create field-accurate 3D Building Information Models (BIM) that improve communication from the earliest stages of design and result in smarter scoping, better-informed scheduling, and more efficient decision-making. 3D Laser scanning is gaining popularity among AEC professionals, many of whom have adopted the high-definition surveying method not only for its unprecedented accuracy but for the time and money it saves them. Capturing field data and millions of precise coordinates to generate a digital record of the space, known as a point cloud, laser scanning provides a highly accurate recording of a site and its conditions at a rapid pace, saving countless hours that would be lost to manual measurements and site visits. The valuable insight provided by the point cloud data occurs when it is converted into a 3D BIM model. 3D models, used throughout the construction process, provide visualization and measurements that help to create accurate budgets and schedules, identify clashes, measure and evaluate progress, and allow you to keep an accurate, detailed record of as-built conditions. Our state-of-the-art laser scanners survey site conditions with greater accuracy and detail than any other scanning method, measuring and recording millions of discrete points that generate point cloud data in a fraction of the time as legacy survey methods. Our 3D modeling experts process the point cloud data from your 3D laser scan to develop a highly-precise 3D model for your immediate use that also serves as a permanent record for future needs. 3D laser scanning improves your project productivity by giving you the ability to stay on task, meet critical deadlines, and stay on budget by getting the most accurate data the first time! 3D laser scanning eliminates the need for multiple site visits due to lost or missing measurements and accuracy. Accurate and complete as-builts safeguard against conflicts, helping you see inaccuracies before they turn into change orders or rework. 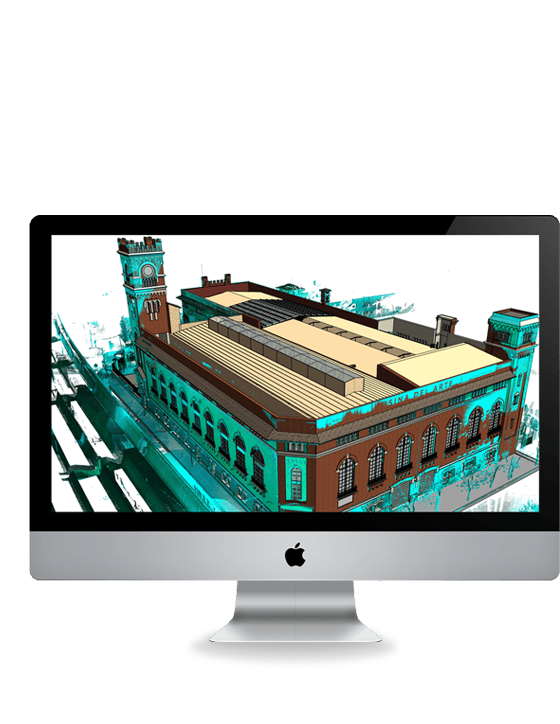 With 3D laser scan-to-BIM, 3D virtual models give AEC teams 360° access to current conditions and help them to make decisions with certainty and achieve greater collaboration, productivity, and quality throughout the building cycle. In an industry plagued by both shrinking budgets and timelines, productivity lapses aren’t just unfortunate; they can derail projects, bust budgets, and hinder an entire organization’s growth. Catching constructability issues before they occur is just one of the critical benefits of using 3D scanning to create BIM models that help identify problems that, if left unresolved, can lead to failures in functional design, fabrication, and scheduling. Out of date or incomplete as-builts don’t give you the information you need to move forward with a renovation project confidently, but they’re frequently the only drawings available. Rather than relying on rough estimates or unconfirmed as-builts, laser scanning can provide you with the structural information you need to design and execute on time and within your budget in a renovated space. Going from raw laser scan to point cloud to BIM usually requires a collection of specialized vendors, software, and hardware. At ARC, it’s all under one roof. ARC’s single source 3D Laser scan-to-BIM solution reduces survey time by up to 50%, producing point cloud data from your raw laser scan and converting it to an accurate and interactive 3D model. With our one-stop scan to model approach, you can focus on other aspects of your business while our experts are deployed to capture the data you need to produce a down-to-the-details three-dimensional simulation swiftly. Our 3D models help project managers more accurately scope and efficiently schedule construction projects. Logistical roadblocks are easily visualized ahead of time and avoided. Craft detailed and comprehensive budgets and schedules, coordinating contractors with greater efficiency and transparency. Compare construction progress to as-designed models so you can keep on-track and on-plan and catch any issues early. Create as-built models at construction milestones that help to speed up closeouts and avoid future claims. Cross-functional teams seamlessly blend when there is a single, digital workplace. Scan-to-BIM reduces the need for reworks, change orders, and project delays. The median direct cost of rework on a typical construction project is estimated to be between 4-6%, with this figure increasing to 9% of total project cost when indirect factors are considered. It’s so pervasive, in fact, that much of the industry consider it unavoidable. With poor project data, miscommunication, and poor document control contributing to greater than 50% of rework, AEC professionals who aren’t willing to accept costly mistakes as their status quo are using 3D models produced from laser scans to centralize and streamline collaboration across cross-functional teams. With dynamic reality capture models, clashes are resolved, and workflows are created and communicated before construction projects kick-off and throughout the lifecycle of a building, reducing rework to as little as 1%. ARC’s 3D Laser Scanning services remove the barrier to entry that many firms encounter when considering laser scanning to capture their field data: the cost. Not only do organizations pay the upfront price to own a laser scanner, but they also have to invest in software and training for their teams, and can expect future costs for repairs and upgrades as the technology continues to evolve. Outsourcing 3D laser scanning to the scan-to-BIM experts at ARC frees you not only from the initial costs of investment, but also the ongoing expenditures that will be required to update, replace, and modernize your scanning equipment and software in the future. With an all-in-one service, you gain access to the latest scanning technology without losing hours and overhead to training, site visits, and modeling.